1. The approach: the game features a perfectly measured, progressive path from the linearity of the first episodes to a more open experience as one reaches the end. It’s an ideal process for a newbie (who would feel like they are making progress quite easily) and a wise approach for an expert (who would get more involved in the game, as it becomes more difficult). Furthermore, even the more linear first chapters are “disguised”: in terms of gameplay and mechanics, travelling from “one-screened” Azores to “two-screened” Iceland may not differ from going from “one room” to “the room next door”. 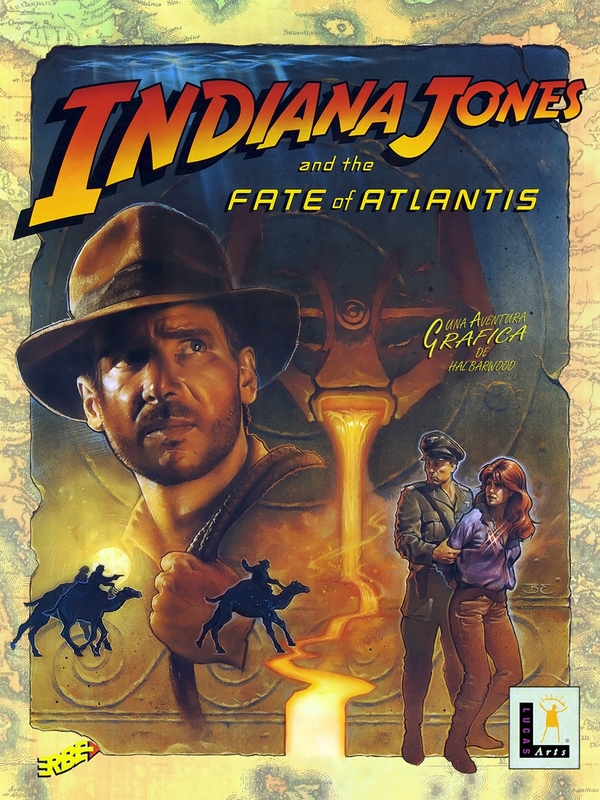 But just insert the good old “Indiana Jones flight route map” in between, and the player experience is quite different… Brilliant! 2. The alternatives: do you want Sofia to come with you or do you feel like going on your own? Do you like fighting more than stealing? Do you prefer camels to a balloon ride? Are you fond enough to retrace for love? It’s up to you! And the best of it all, is that it’s not just a question of gameplay choices and replayability; but it also even involves some kind of moral decision making, which is tougher… and incredibly up-to-date! 3. 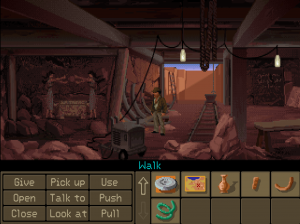 The interactive intro: one of those cool ideas LucasArts used to pull out of thin air. 4. The epic: yes, Indy stars in it, so it’s supposed to be easier for the game to exhale that heroic feeling. But you only have to take a look at the disappointing “Indiana Jones and the Kingdom of the Crystal Skull” to see it takes more than a character to achieve it. 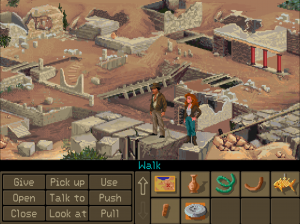 Playing “Indiana Jones and the fate of Atlantis“, more than 20 years after it was released, is still an exciting and fun experience. Some mechanics, such as labyrinths and combination puzzles may seem completely outdated (I think I’ve had nightmares these days with the spinning stone disks…). 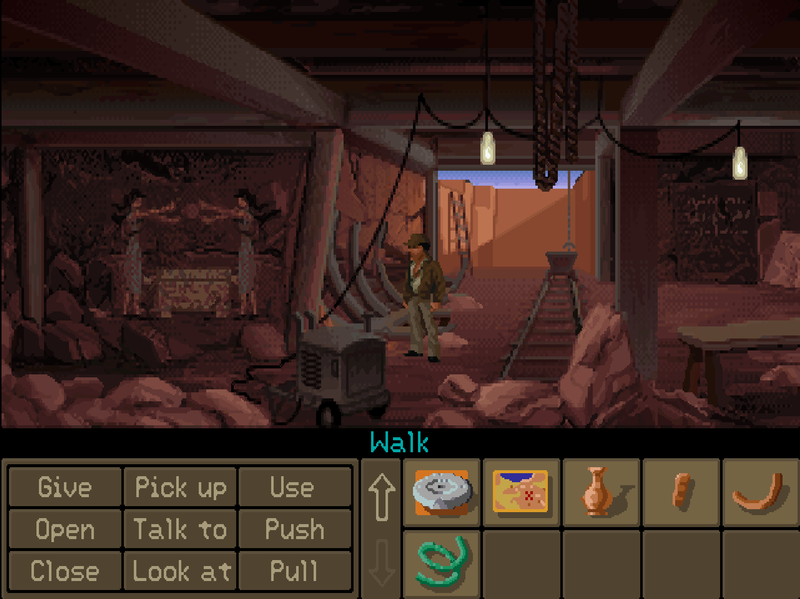 And it is true that one misses those marvelous secondary characters so important in LucasArts previous adventures. But the plot, the puzzles (some of which are completely awesome), the mood, the structure… are so brilliant, that there’s no doubt the game is still top notch. It seems like you had to hide the blog for a while, but a remake of “The Fate of Atlantis” sounds cool!